I love blogger’s choice swaps. It means I get to spend hours (yes, hours) perusing another blog. The only downside is that it’s nearly impossible to just choose one dish to make. This time was no different. The blog I was assigned was Cookaholic Wife. Again, I ended up with over a dozen dishes I wanted to make. 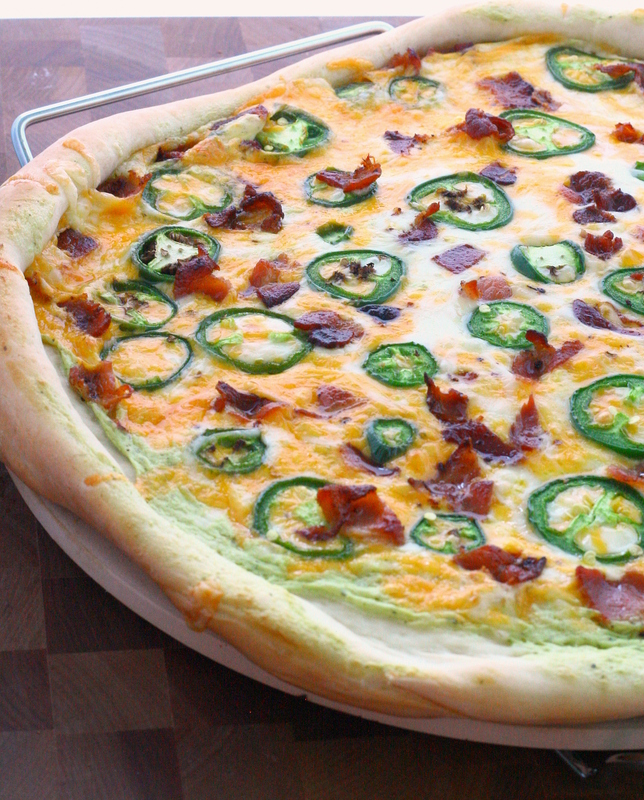 I generally lean towards desserts, but the jalapeno popper pizza caught my eye. Jalapenos. All over a pizza. With a jalapeno ranch dressing. And bacon. To make the dressing: combine all ingredients except for the cream cheese using a hand blender, food processor, or blender. Mix until smooth. Mix in cream cheese until well combined. Preheat the oven to 450°F. Place pizza stone in oven and let it heat for at least 30 minutes. Stretch prepared pizza dough into a circle 12″ in diameter. Fold edges over to create a crust. Spread jalapeno ranch dressing over dough and sprinkle cheese on top. 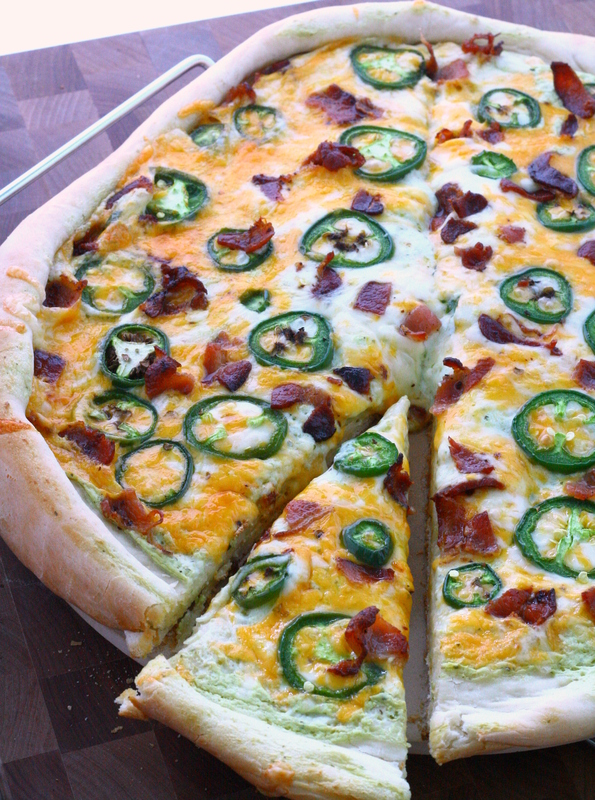 Top with jalapeno slices and bacon. Bake for 10 – 15 minutes or until cheese has melted and crust is lightly browned. Serve immediately. Thanks to Taste of Home Cooking for organizing! Make sure to check out the other recipe swap posts! Categories: Main Entrees, Pizza, Vegetarian & Vegan | Permalink. Glad you liked it! This is definitely one of my favorite pizzas ever. This looks sooo good!!! I think it would be great cut into small squares as an app. Ooh, pizza for apps is a great idea! I’ll have to keep this in mind next time we host a party. Wow. This sounds incredible! I don’t know if it would fly at my house (my daughter doesn’t like spicy stuff) but I might need to make it anyway. The jalapeno ranch sauce wasn’t too spicy, but it had a great flavor. You could try that and then just put bacon (and maybe chicken) on the pizza for your daughter! This sounds amazing and I’m jealous of how gorgeous your pizza crust is! I’m with you, girl. 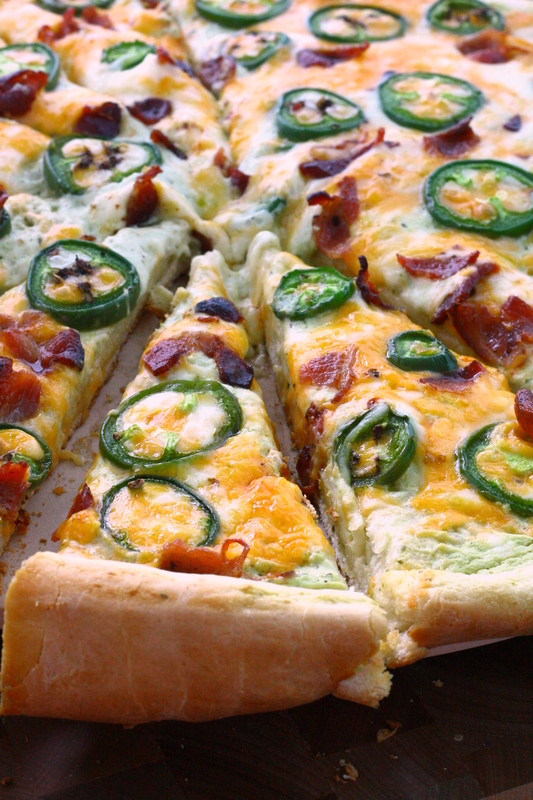 I LOVE spicy food and would totally be adding extra jalapenos to my pizza! Thank you! I love this crust so much – I haven’t tried any other recipe in over a year! Yum! I want this, it looks like all of my favorite foods put together. Genius! This looks so awesome. It’s going on the meal plan for next week!